Grocery Cart Challenge Giveaways: Heartfelt Words Giveaway! Lisa from Heartfelt Words contacted me a few weeks ago and wanted to sponsor a giveaway. So I hopped on over to her website to see what she had to offer and, "WOW, YES!" Was my answer. 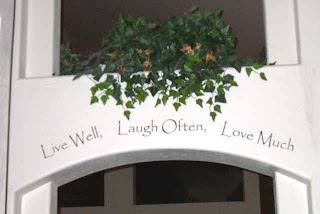 Lisa offers quotes, sayings, plaques and all kinds of personal words that you can put on walls. I love how having a special saying on your wall or sitting on your mantle can bring a whole new feeling of coziness into your home. And just to tell you how nice Lisa is, she made me my very own monogrammed tile. Her stuff is amazing and very high quality. Mine is a luscious creamy colored tile with our last name, a scroll work design, and a a stand that looks gorgeous in my living room. How neat would that be to give to someone as a Christmas present? So Lisa has offered to give one lucky winner their very own 12 inch monogrammed name tile worth $45. Here's how you can enter to win. For a second entry, Tweet or Facebook about it and come back to tell me again in the comment section. Only U.S. residents please. Entries will be accepted until midnight (PST) Saturday night and the winner will be contacted and announced on Sunday. In the meantime go check out Lisa's website and get a headstart on your Christmas shopping. She offers way more than I showed you and you can create a one of a kind gift for someone you love. Wow, what a wonderful giveaway and a great idea for a xmas present! Thanks for the opportunity, these are beautiful! I shared it on my facebook too :) Thanks again! This looks neat! Thanks for the giveaway! I have these all over my house and I love them! I would love the address sign. I've always wanted one. I told everyone on FB :) Thanks again! I love the one about Hope! I love your blog and read it every day! Thanks for all the great information! What a lovely idea. Thanks! Hope I can win one for my house! Thanks for a chance to win. I know right where I would put it. These are fantastic! I would love to have one and give one! Wow, these are awesome! Thanks for the chance to win! I would love to give this to my daughter for a Christmas present! How beautiful her work is! I can think of a couple people I can think about for gifts from her site. Thanks for the information! That is so beautiful. She does an amazing job. That would be a great Christmas gift!! Love it all!! Thanks so much! oooohhh now this is cool! This would be so fun to have, they are beautiful. Love it! I think I could go overboard and then some at her website! my facebook friends now know! She is very gifted-been looking at these for Christmas gifts! Wow, that is an absolutely gorgeous tile. Most definitely enter me. Thank you. Thanks for entering me. I love those plaques!! That is beautiful!!! Great giveaway! Thanks! That is a very different giveaway - beautiful! How cool! That would match my new kitchen decor perfectly! That is so pretty! I would love to have one of those. Thanks for the chance. This is a great gift idea! Very beautiful! Would love to give them as gifts! Made a mention on Facebook!! gorgeous!!! now i'm off to post about it on facebook! ok, i posted on facebook...it didn't want to take my post, grrrr! This would be great! I also posted on FB about this giveaway. I have purchased items from Lisa before as gifts-- and I have some of her tiles in my house. Beautiful way to personalize someone's home. very lovely! Pick me, pick me! So beautiful! I would LOVE to have a tile like that! This would be a great wedding or house warming gift! These are so pretty - what a great gift, for me! Thanks for the giveaway! My first comment. I'll be back in a sec after I tweet and FB this bad boy. Really nice! I would love to have one! Wow! What nice stuff... please enter me. What awesome ideas, would love to be the proud owner of one of the tiles,would look awesome in my house. I saw this and immediately said, "If I don't win it, I'm getting one for my mother-in-law somehow!" How beautiful, unique and just right for the hard to buy for person on your list. Great giveaway Gayle! Thanks. I love Lisa's stuff. I have bought some for others...I would love to have one for myself! I Love this "absoulutly beautiful"!!!! And thanks so much for a chance. What a beautiful giveaway and a great idea for the upcoming Christmas season. I would love a tile!! I want one in PINK!! Can you do a Pink ribbon? 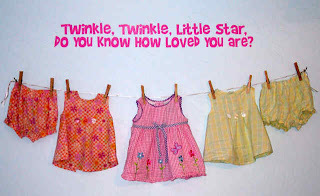 Love your stuff - sooo creative! How pretty. I love the custom job. And you're right, Gayle! It's so nice to have beauty and comfort in our homes - in whatever form they come in! I'm entering...her stuff is so cool! Am lovin your site! I will be thanking my friend for sending me here! We just moved into a new house. I would love to have the name plaque. Thanks for allowing us to enter! It was so beautiful! What a wonderful giveaway. Love the tile. Thanks for the chance to win. I love the monogrammed tile...very chic. These are so cute! 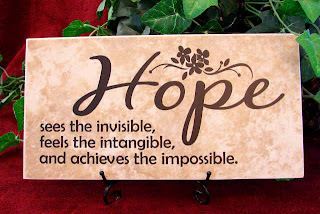 I love the "Hope" and monogrammed styles! Would love to have one! I just told everyone on Twitter and FB to visit Lisa and check out her stuff! What a terrrific giveaway! She does beautiful work! I love anything that is customized! So cool! Thanks to you and Lisa for an awesome giveaway! I facebooked and tweeted you! Oops, forgot my email address. I love anything monogramed. Great givaway! I forgot to leave my e-mail addy but it's linked on my profile--please feel free to delete one of my comments lol...but this would make a great gift for my sister and her fiancee. I could give it to them as a housewarming gift!! handshouseandheartfullatgmail.com !